We're excited about the global release of a new extension, exclusively on Bing Ads — Action Extensions. This extension allows you to highlight a clear call-to-action on your text ads, to entice customers to immediately click and drive them to your website. Bing Ads is updating our Annotations offering with reporting and easy opt-out and renaming it to Automated Extensions. As part of the constant evolution of the Bing search engine results page (SERP), we are going to be retiring Sidebar Text Ads on Bing O&O inventory on March 26th, 2018. 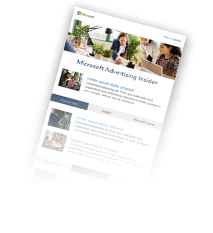 We are very excited to announce that the Dynamic Search Ads (DSA) beta is now open to all advertisers in the United States. DSA is designed to help advertisers increase their impression volume, increase search term coverage and drive incremental clicks and conversions, while reducing the burdens of campaign set up and day-to-day management.